As with any remodel there is always something that does not go according to plan. If it's only one thing then that's pretty much a miracle. Another rarity is finding something interesting in the process. Turns out both of these things were true for the part of the job that involved the window over the sink. As a refresher, this is how it looked when the remodel started. The plan was to remove the window sashes and replace them with two 46 inch high windows and raise the sill up about 12 inches. Oh, Oh! Looks like the plan has taken another turn. The casing had to come off? OK, it had to be shortened to adjust for the raised sill and it would be easier to cut to fit if it was off the wall. The next bump in the road came when it was discovered that the window opening measured 34 inches at the front of the sill but got narrower as it went towards the back. So now those double windows were not going to fit. So, off came the jam to be replaced in a tidy and, might I add, square fashion. During the clean up, Ron heard a ping as he moved the rubble into a pile. He investigated and found a business card ... a rather interesting one! It is actually metal. 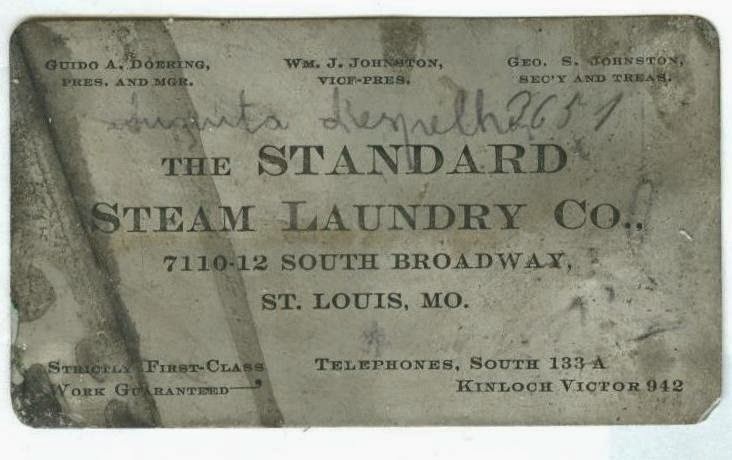 As you can see, the business was called, THE STANDARD STEAM LAUNDRY CO.. and was located at 7110.12 on South Broadway in St. Louis, MO. The telephone numbers listed were: South 133 A and Kinloch Victor 942. It also lists the President and Manager as: Guido A. Doering. The Vice-President as: Wm. J. Johnston and the Secretary and Treasurer as: Geo. S. Johnston. Someone wrote a note on the card but it is difficult to read. It looks like someone's name followed by the numbers, 2657. The backside of the card was not left blank as you can see here. 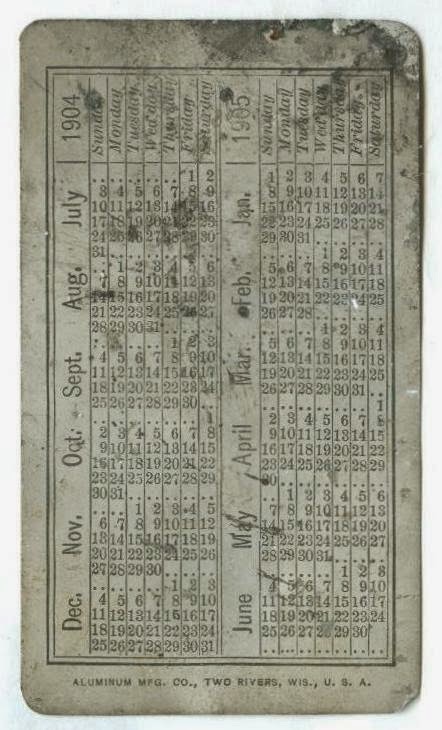 It shows a twelve month calendar from July-December of 1904 and continues from Jan.-June of 1905. The card was printed by Aluminum Mfg. Co. of Two Rivers, Wis. U.S.A. So, about that window....it's still right where you saw it pictured. Other things have taken precedence. Stay tuned for the next episode.